Thursday 9th - Saturday 11th May 2019 . This event is 16 and over. Any Ticket holder unable to present valid identification indicating that they are at least 16 years of age will not be admitted to this event, and will not be eligible for a refund. This ticket allows access for those aged 16 and 17 to specified core TGE festival venues (due to licensing restrictions) over the three days of the festival, subject to each venues capacity. A Young Adults ticket does not allow access to The Spotlight Show. Line up subject to change. Venues open for Young Adult ticket holders until 10:30pm each day will be announced early 2019. Folk fans will be treated to River Lea's newly signed Lisa O'Neill's with her raw Irish ballads, Brighton's homegrown singer songwriter Maisie Peter's narrative songs, plus many more folk-led artists. The Great Escape is excited to unveil R&B and soul artists from across the territories such as hotly tipped Greentea Peng with her experimental lo-fi feels, Irish neo-soul singer Biig Piig pulling in the romance, plus many more. Pop and dance enthusiasts can look forward to brand new music from the likes of the irresistibly, charming New Zealand four-piece Drax Project, The Mauskovic Dance Band which will bring you the Afro-Caribbean meets space-disco you've been craving, plus many more. The Great Escape will allow you to discover your next indie anthems by announcing artists such as the ennui indie, energy-laced band Sport Team, softly thematic, bedroom-pop heroine girl in red, Rotterdam's throwback rock band Lewsberg, plus many more. 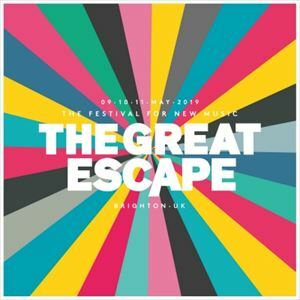 The Great Escape hits it hard by introducing some heavies to the line-up including Swedish self-loathing post-punk band Viagra Boys, DIY inspired trio and riot grrrl activists Big Joanie, Australian disco-powered blackened punk'n'roll Pagan, plus many more.